Some of you may remember the quilt I am making for my sister. 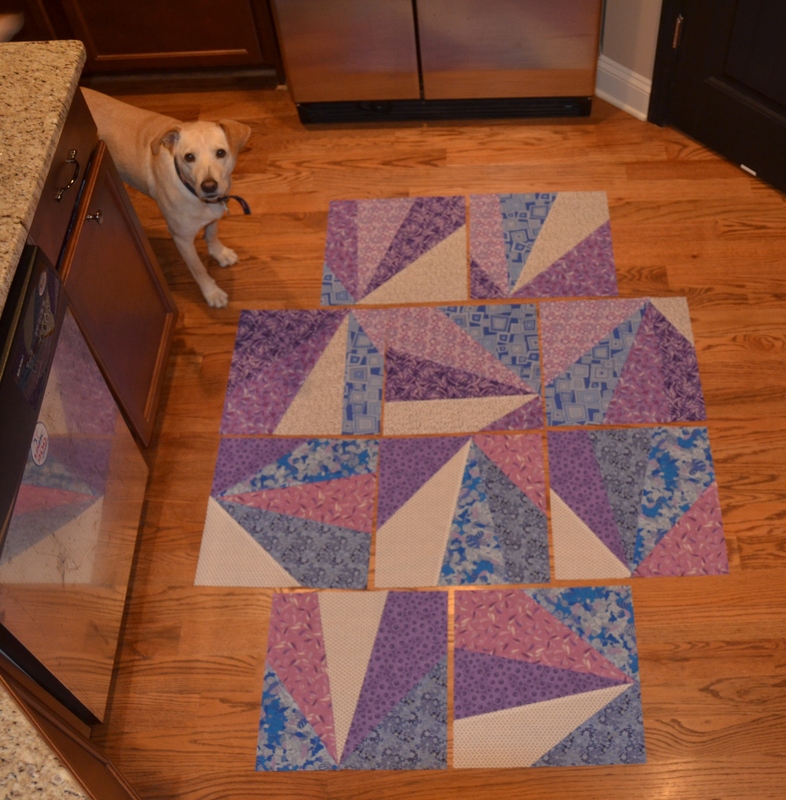 I’m using the Refracted Quilt tutorial by Melissa at Happy Quilting to make her a blue and purple quilt. So I haven’t shared any progress on this quilt since the beginning of October. I’ve been putting my focus on some other projects while chipping away bit by bit on this in the background. Last time I shared it with you, I’d only completed 10 of the 25 blocks. Well now I have all 25 blocks completed and I have the sashing added so that they are attached in rows! The lighting isn’t the best in our extra bedroom but that is the only room with enough floor space to lay everything out. It also probably didn’t help that I took this at about 11:30 pm last night! I really love how it is coming together! 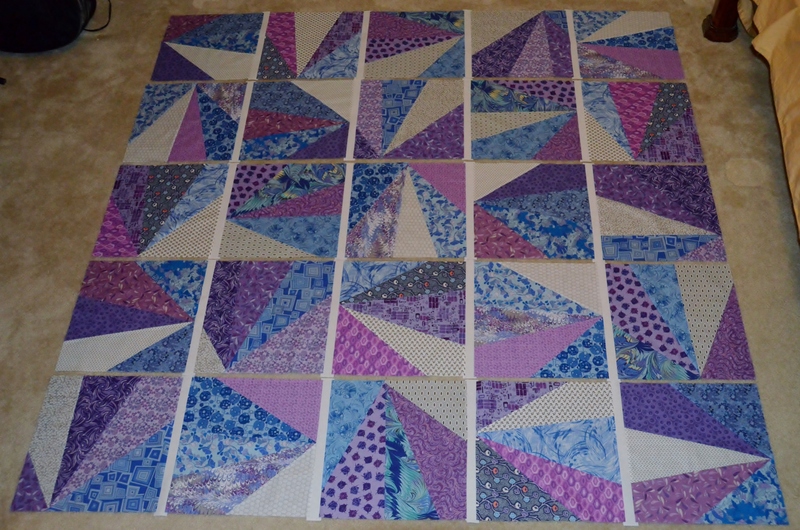 I just need to do the sashing between each row and the border on the outside and I’ll have this quilt top finished. This entry was posted in Work in Progress and tagged blocks, blue, Modern, purple, work in progress by Kim M. Bookmark the permalink. Nice. I like the colors! And it’s cool how the sashing stands out so well. Will the border be white? Good luck on a quick finish. I love this quilt! Was it a difficult pattern to piece? I love these colors! Thanks for sharing the link, it looks like a really fun one to make. What a lucky sister you have. Bravo! Lovely colours. Bright but not garish. That’s beautiful. 😀 And you’re almost doneee! I love that feeling. 🙂 And then I remember that basting comes between me and the actual finish! It looks beautiful and isn’t it funny the times we decide to take photos! You’re doing such a wonderful job on this! I love the thin sashing, too — so modern 🙂 Well done! It is great to see your progress on this blue and purple beauty. Keep up the good work! Your sister will be thrilled! Those colors are amazing. Gorgeous. Oh, this is really cool! She is going to love it! This is a really cool pattern and I love the colors you chose. I also like your little four legged helper. I usually have one or two doggies helping out in the studio also. These are really beautiful colors. your sister will love this! Great pattern and lovely colours!